It was a lot easier to set up QEMU than I expected it would be. Easier even than the online tutorials make it seem. Download a prebuild image for the guest system you want to run. In my case, I wanted armel, which meant I also had to download initrd and vmlinuz images. data.img is not a block special device. <SIZE> is a size in kilobytes, or use suffixes M and G for megabytes/gigabytes. The image only has to be big enough to temporarily hold the data you want to copy; you can move it to the guest’s root filesystem before you start working with it. <MOUNT_POINT> is any existing empty directory where you want to mount the image. I just made a directory foo in the same directory as the image. You should copy over any data now, because apparently it would be VERY BAD to do that while QEMU is running. 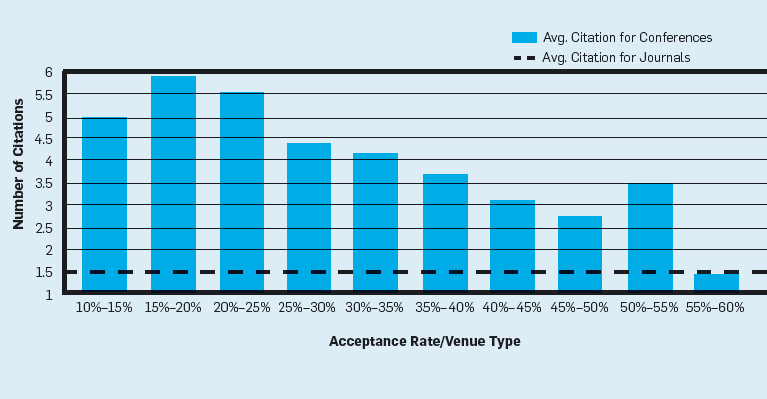 Notice the -hdb data.img argument. That sets up the data image we set up in the last step as a disk drive in the guest system. You can probably login as user with password user. The root password is probably root. Now you can copy over your data. And here’s the beautiful part: you should be able to get on the network with no problem. If you need anything that’s not installed, just apt-get update and then apt-get install the missing package. Should work, no problem. The HTPC is purchased, assembled, and installed. Our cable service has been cancelled and we are streaming the Project Runway finale even as I write this. This is the first in a series of posts I’ll write about the whole process of putting the thing together. Today, I’m going to focus on the hardware components and the process of assembling the PC. Here is the final list of the components I actually purchased. There are only minor differences from my preliminary list. I upgraded to 4GB RAM, because I just felt like I ought to. I added a power supply, because I was under the misapprehension that the Fusion case included one and it didn’t (this mistake set back the project by a full week). I added a heat sink, because the stock CPU fan is annoyingly loud at peak (although peaks should be rare under normal usage). And I swapped the Samsung IDE DVD+RW drive for a Sony SATA drive (see below). The total cost, including tax and shipping (but excluding the re-stocking and re-shipping fees for a few mis-steps, about which more below) was $630. 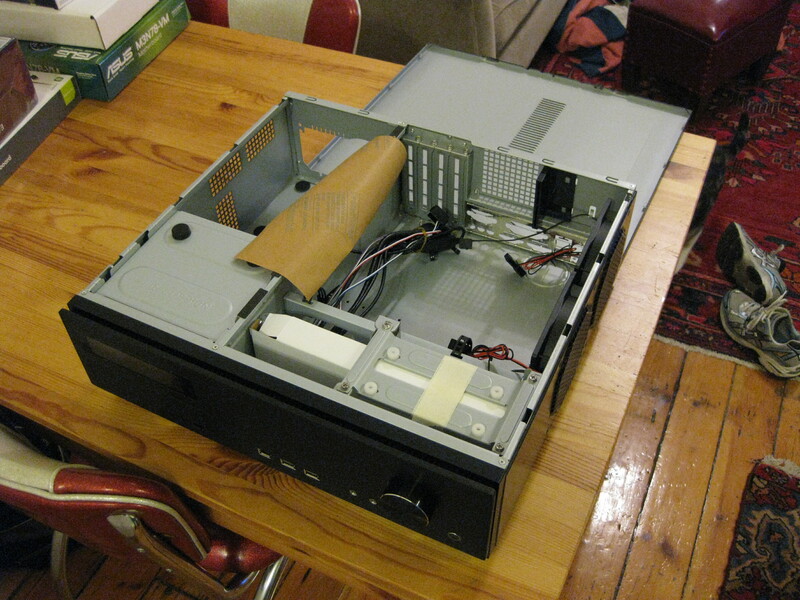 Notice that the Fusion case has a “three chamber” design, where the power supply, the motherboard, and the hard disks are isolated from one another to improve cooling. The hard drives are mounted in funny brackets with silicon grommets to reduce the noise from vibration. This took about 10 seconds to fix, once I realized my mistake. I didn’t notice in the pile of miscellaneous cables I had amassed or read the case manual closely enough to look for the 24-pin power cable extension with a special dongle for hooking up the front panel LCD screen (which also serves at the remote control’s IR receiver). This led to a fair amount of frustration and wasted time trying to get the LCD screen and remote control to work, as you might imagine. I only figured this out after an 11th hour Google search had not turned up an off-hand comment in a user review by “RG”at Newegg.com This took about 2 minutes to fix once I realized my mistake. The first heat sink I bought did not fit in the case; it was too tall. It did not even occur to me to check the dimensions before ordering—I just chose the cheapest quiet cooler I could find. Note that the LCD display is lit but displaying no useful information. More on that next post. The time has come for new audio-visual technology in our home. The 8-year-old PowerMac G4 that stores our iTunes Library has reached the outer limits of its useful life. Our cable box is an aggravating piece of junk. Our DVD player takes about thirty seconds to decide whether it wants to open its tray, or close it, or open it then quickly close it again before you can do anything with it. Store all of our music and photos. Be upgradeable, so I don’t bitterly regret decisions made about storage, memory, or other hardware in the future. A case that will fit comfortably on top of the stereo receiver. A hard disk big enough to hold our entire music library (preferably in FLAC for the music ripped from CDs) and some reasonable amount of hi-def video (say 30 hours). Our music library is currently about 90 GB, as medium-to-high quality MP3s. I figure I need a terabyte or more. 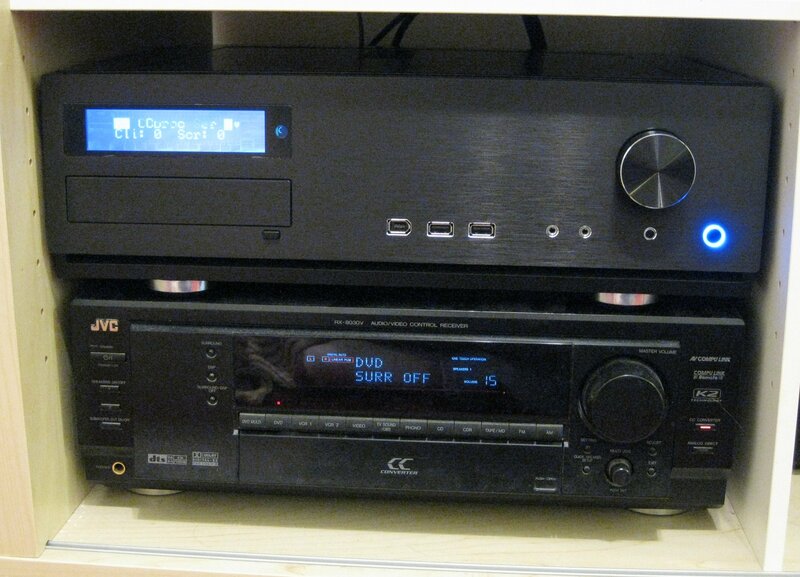 A DVD or Blu-Ray player. HDTV-quality video output (HDMI, I guess). 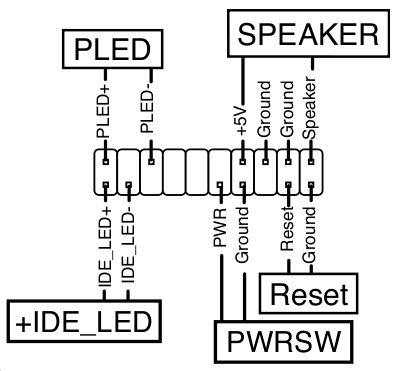 An IR receiver for use with a remote control and/or wireless keyboard and mouse. A clever cooling system so that it doesn’t make an infernal racket in the living room. Playing Blu-Ray movies is not currently possible on Linux, due to DRM restrictions. This is the case even if you paid for the Blu-Ray disc in the first place. Recording non-free HDTV programming (e.g., pay cable) is not currently possible on Linux (or even on any device that was not specifically made for the purpose by some giant corporation), due to DRM restrictions. This is the case even if you paid for the programming in the first place. I’m willing to compromise on both of these points. I have no reason to believe that either won’t become technically possible in the future (though probably not legally). From my research online, I haven’t been able to find anybody who will build me such a computer without installing Windows on it. 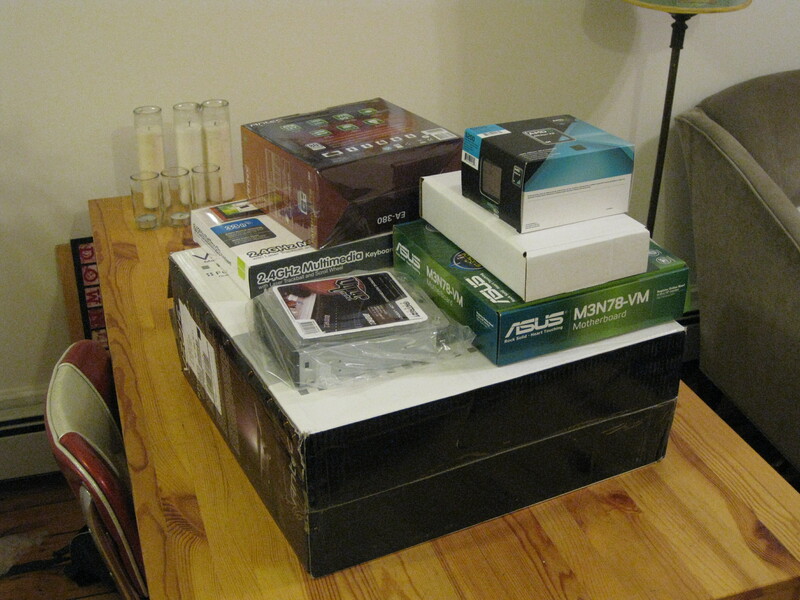 The alternatives seem to be to (1) build my own box from scratch, buying the case, motherboard, CPU, etc. separately and assembling them myself, or (2) pay a premium of several hundred dollars for a pre-built computer running Windows and install Linux on it. I don’t mind paying a premium to have an expert assemble my computer, but the portion of the premium in (2) that goes towards paying Microsoft monopoly rents galls me. I’m willing to pursue (1), but it seems like a really big hassle. I’ve never built a PC from scratch before and there are a million choices for any given component. I’m a bit paralyzed by the fear that I will make some epically bad choices. Talk to me people. Does anybody know of an outfit that will sell me a pre-built Linux HTPC? 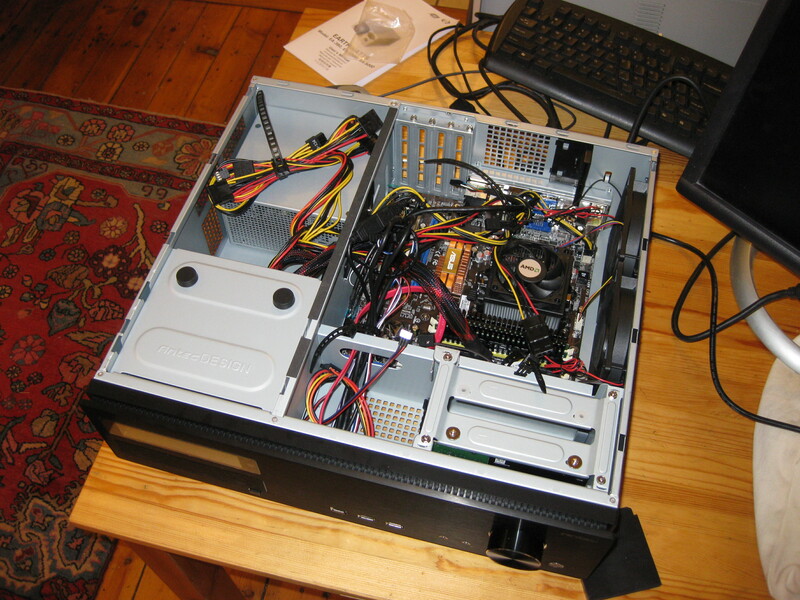 How about a bare-bones OS-less HTPC “starter kit”, e.g., a case with the power supply, motherboard, CPU, and heat sink pre-installed and the various ports pre-wired? (I can handle RAM and disk drives, no problem.) Any advice on building my own? I left my iPod Nano in the back of a cab a few weeks ago (yes, I was drunk). To punish myself, and to hopefully avoid some of the problems I’ve had using iPods with Linux (see here and here), I decided to buy a Sandisk Sansa Fuze. This is basically a generic Nano: an 8GB solid state media player with a small screen and video capabilities. It’s about $50 cheaper than the Nano and about 50% crappier in every dimension: it’s bigger and thicker than the Nano and suprisingly heavy; has a first-gen iPod-style mechanical scroll wheel and a misaligned headphone jack; the screen is noticeably low resolution; and the control is counterintuitive (the main menu items swoop diagonally from lower left to upper right—I still can’t wrap my head around which way to turn the wheel). It does have several features that the Nano lacks, e.g., a built-in FM radio and a voice recorder, which I plan to use approximately never. My expectation that the Fuze would play nicer with Linux were met in one big way: in MSC (USB Mass Storage Device Class) mode, the Fuze looks just like a USB flash drive with some special folders set up (e.g., Music, Videos, Podcasts, etc.). Copying music onto the device is easy as pie. No need to worry about a cryptographic hash. No need to recompile Rhythmbox or Amarok. It Just Works. My expectations were frustrated in other ways. Connecting to the player in MTP (Media Transfer Protocol) mode required backporting libmtp 0.3.7 from the Karmic repository. This is no big deal, because the one and only reason I wanted to connect via MTP was to remove the lame music and videos that came preloaded on the player. (Media loaded in MTP mode can only be removed in MTP mode. Media loaded in MSC mode can only be unloaded in MSC mode.) The Fuze crashed when I tried to eject it in MTP mode. But I rebooted it and the files were gone, so I’m happy. Podcasts have a tendency to show up with strange, undescriptive code names. This might be Gpodder’s or the podcasts feeds’ fault, for all I know. Overall, I’m content with the purchase. The Fuze is definitely Less Cool than the Nano. But next to an iPhone, a Nano is a pretty weak status signifier, don’t you think? Last Wednesday night, a drunk motorcyclist hit my niece and brother-in-law as they were crossing the street. My brother-in-law, Aaron, lost a leg and may not regain the use of the other. My niece, Melody, was killed. She was nine years old. A memorial fund has been set up to help support the family during this crisis. Please consider making a donation. Even a small amount can help a lot. Donations can also be made in person at any Wells Fargo location or mailed to “The Osheroff Family Fund,” c/o Wells Fargo Bank, 1590 Grant Ave., Novato, CA 94945. NOTE: The Paypal account is managed by Ben Osheroff, Aaron’s brother. All proceeds will be transferred directly to the Memorial Fund.